Once in a blue moon, I'll post a preview to an upcoming show in Pittsburgh. This is one of those occasions. 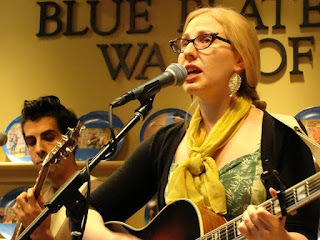 Friday, September 30, Rebecca Pronsky comes to the Funhouse at Mr. Smalls. The evening also serves a release show for local singer Ben Shannon's Farewell Mountain CD. He performs too, along with Emily Rodgers and Morgan Erina. Doors open at 8 p.m. Show at 9 p.m. Get tickets at www.ticketfly.com/event/1257801. It's only $10! It's been a while since we heard from Rebecca Pronsky, who hasn't released an album since 2013 (Only Daughter). That album earned her a spot of The Telegraph's Top 10 Country albums of 2013 list, which says quite a bit about Pronsky's songs. Though she's not a tried-and-true country songstress, her music - which includes releases that date back to late '00s - has the best elements of country music: a yearning quality (due in no small part to guitarist Rich Bennett's sweet leads), music that tugs at your ear and says, "Listen" and - most significantly - compelling storylines. And not the traditional country plot lines either. I'd bet good money that Pronsky could put fresh spins on tales of drinking, infidelity and the regret that comes with the first two, but her lyrics align her more with the best in singer-songwriters. On the new Known Objects she begins by getting a tad existential with "Bag of Bones," which looks at artistic self-doubt. The initials of "A.E." belong to Amelia Earhart, in a song that meditates on the newly discovered evidence that "Lady Lindy" did not crash her plane but landed on an island in the Pacific Ocean, where she was marooned. The latter subject alone invites all sorts of speculation and could fuel a whole album of songs. (Maybe this country music moniker fits better than it initially seemed.) But Pronsky reduces it to crucial elements, which make a compelling tune, which leaves the listener wondering exactly what happened. Elsewhere "Snowing Sideways" depicts a romantic interlude by mentioning some of the scenery that can provide the most vivid images in your head while listening. Known Objects features a revolving group of guests, from jazz guitarist Ben Monder to the four-part harmonies on "Gondwanaland" and "Blue Skies" from Lucy Wainwright Roche, Greta Gertler, Emily Hurst (Las Rubias Del Norte) and Deirdre Struck (Lascivious Biddies), who add a rich, warm quality to those songs. Even without the guests, Pronsky's songs all sound distinct from one another, sequenced in a way that the moods, tempos and sonics vary with each track, still creating a full program. All goofy stuff aside, Pronsky should be even more widely known than she currently is. Playing right now: Chris Connor, Chris. Used copy of the Bethlehem LP, in large part because it has her version of "Lush Life," which I love. As in, it might be my favorite version of the song. The past weekend was crazy. First of all, I said I'd star in an installment of HeroinesBurgh - a comicbook type series about super heroines fighting crime in Pittsburgh (the brainchild of illustrious independent-minded guy who's been booking shows in town for decades; locals will know who I mean). 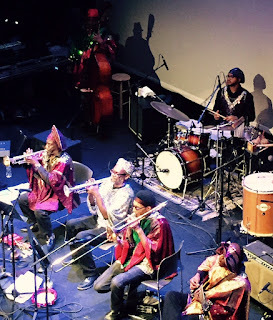 On top of two days of that, the World Saxophone Quartet played at City of Asylum on Saturday and the Sun Ra Arkestra played Sunday night at the New Hazlett Theater. You read correctly - both of these top shelf acts were in town two nights in a row. In Pittsburgh! We don't get that kind of attention on a regular basis. I had to go to both, of course. I talked to Oliver Lake in advance of the WSQ's appearance for City Paper. It has been a few years since they've all played together, and about eight or nine years since they came to Pittsburgh. Last time, James Carter was filling in for tenor saxophonist David Murray. Carter is great, but there's something about David Murray, with his brawny sound and sense of invention, that pushes this group over the top. Seeing him with his quartet at the Balcony back in the late '80s, I remember thinking that his approach to improvisation was like a model of DNA - a ladder-like design that twisted around and kept moving upward. The higher you get on the model, the further away you may be from, in this case, the melody of the song. But you can still feel the connection, even if someone like Murray is pushing beyond the register of his instrument, adding shrieks to his melody. The four members of the group - Lake, Murray, alto/soprano saxophonist Bruce Williams and baritone saxophonist Hamiet Bluiett - walked through the audience blowing their horns on the way to the stage. (Bluiett actually played clarinet on the walk in, presumably because his health problems make it hard to strut and blow a baritone at the same time). They opened with "Hattie Wall." their theme song, which is driven by the baritone's staccato low end groove. Bluiett sounded like he was either missing a few notes as he vamped, or he was taking more breaths to pace himself. But the electricity was in the air. That was followed by "Giant Steps" which relaxed the tempo a bit, compared to the original version. Lake, Murray and Williams (on soprano) each took unaccompanied solos during the tune. At the start of the second set, the Quartet accompanied two poets, as is the tradition with City of Asylum, which has housed and presented exiles poets from around the world. Adriana E. Ramirez read a couple poets while the group accompanied her. The first was inspired by the lives of Whitney Houston and Amy Winehouse, playing a little more on their mythos than their talents. The second talked about taking the citizenship test to become an American, contrasting the people in the test office with a friend conversing with the narrator about treatment in the U.S. Osama Alomar's work read less like poetry than astute metaphorical observations about human nature. The Quartet played brief grooves between pieces, including their low-bottom blues riff "I Heard That," which could have and should have gone on longer. The second set found the group doing some free improvisation as well as some directed compositions. The former was loose but worked well. As with the music from the whole evening, there were times where the group seemed to be pulling in four different directions, but things never sounded busy. 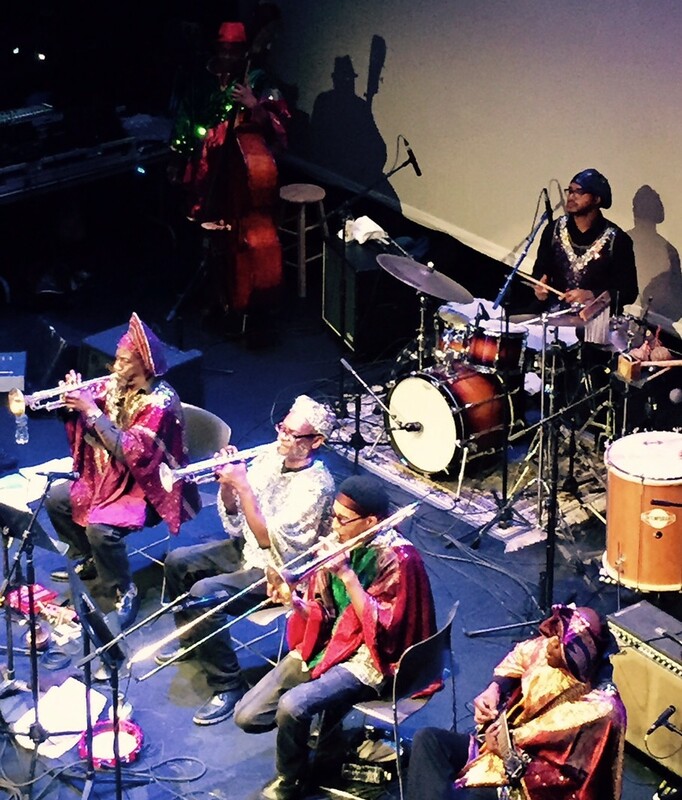 Sunday night, the New Hazlett Theater was packed with people to see the Sun Ra Arkestra. They haven't been to town since 2002. (Prior to that show, I interviewed band leader Marshall Allen, in what would be my first big story for JazzTimes. Coincidentally, he's on the cover of the current issue of JT.) At that time, Allen was 78 years old. I'll do the math for you and tell you the man is 92 years old and still going strong. 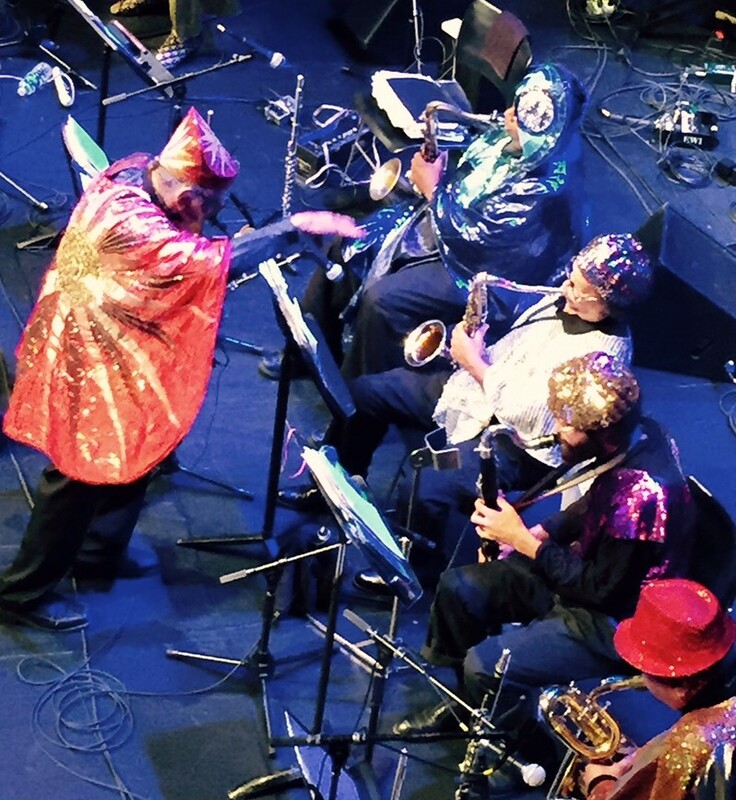 The group's entrance, with members shuffling around the stage, blowing horns at the audience, as drums rolled freely, hailing the most joyful type of free jazz - making it sound like a spaceship had landed, with the occupants dressed wildly - all were clearly informed that this would be an evening to remember. Allen began the evening blowing into his EWI (Electric Wind Instrument), but instead of emitting some slick, fusion-y sounds, it functioned more like a theremin, adding to the outer space quality of the music. Johnny Hodges might have been the first big influence on Allen's playing, but he spent most of the evening blowing wild shrieks on his alto, his right hand moving over the keys with the type of gestures normally seen by a bassist in a funk band. Lest anyone wonder who was driving the Spaceship Ra, Allen was standing for the whole set, cuing the various members of the band, calling songs and at once point, even telling baritone saxophonist Danny Ray Thompson to talk to the audience. The set, which lasted about an hour and 45 minutes, went all over the place. They tackled standards "Sometimes I'm Happy," "Stars Fell on Alabama" and "When You Wish Upon A Star" (which got wild at times in a way almost similar to Spike Jones). But they also played several groove-heavy originals like "Interplanetary Music," (which had more of a melodic backbone than the version I heard on an album that Evidence reissued in the '90s), "Fate In a Pleasant Mood" and the set ender "Space Is the Place/We Travel the Spaceways." One comment I read online said the band could have tuned a little better, because the intonation was far off. Up in the balcony where I was sitting, it sounded fine too me. I wish Allen would've revisited a little of the Hodges style and taken a break from the free squall for contrast. But the guy is 92 years old so I'm not going to fault him for sticking to one thing. I'm just he's still doing it.